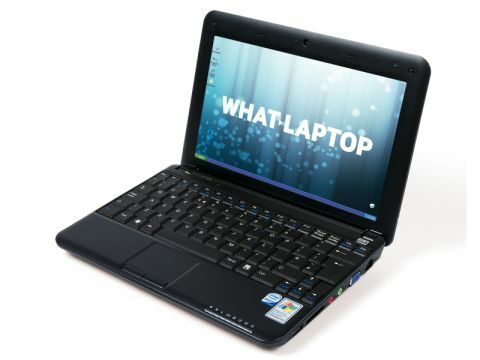 Hanspree is best known for its televisions, but is now the latest manufacturer to enter the netbook market. Its Hannsnote (£269 inc. VAT) is effectively a rebranded MSI Wind, and is a compact and usable offering that provides ample mobility for travel use. The compact black chassis is sturdily built and its black plastics are resilient to scuffs and scratches. The glossy lid is less resilient to such damage, but adds style to this otherwise formal looking netbook. Mobility is strong, thanks to the large battery that protrudes 10mm from the base of the device. This allows the Hannsnote to provide an impressive 285-minutes away from mains power. The large battery also raises the rear of the chassis to a more comfortable typing position. Combined with the well made and responsive keyboard, it provides comfortable usability when typing. The keys are inevitably small, however, and rattle very slightly when typing. The 10.1-inch screen is arguably the best feature. It is impressively bright, and delivers strong contrast and colour reproduction. Its lack of a glossy Super- TFT coating reduces its impact somewhat, but also reduces reflections. Basic office and entertainment use is possible thanks to the 1.6GHz Intel Atom processor and 1024MB of memory. Unfortunately, the large fan on the chassis' left side runs quite loudly during intensive use, which can prove distracting. The 160GB hard drive provides ample storage for such a small device and a flash card reader allows access to popular data cards. Finally, 802.11n Wi-Fi provides high-speed wireless connectivity. While the Hannspree Hannsnote is an effective and highly usable netbook, it fails to stand out from the vast competition in any clear way. On its own merits it is an impressive portable, but the noisy fan and mildly flawed usability may cause you to look elsewhere.